Part two of our bacon journey allows us at Three Dogs to bring together three of our favorite flavors: pork, maple, and bourbon. What could be better than that combination? I found my inspiration while scrolling through my Flipboard feed one evening. There was a picture of one of the best looking pieces of smoked pork belly I have ever seen. The article linked to a website called Salt and Smoke. 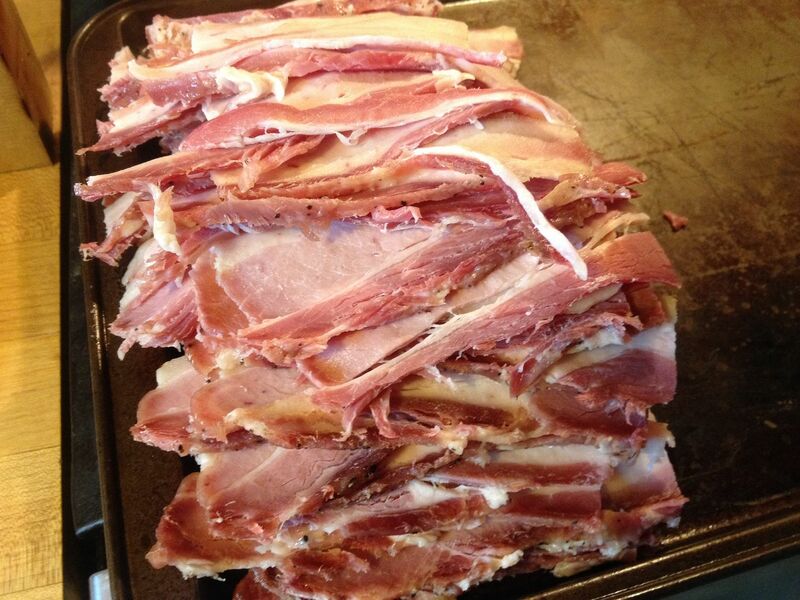 The recipe was for a maple and bourbon cured pork belly that is smoked, then sliced for bacon. Here is a link to the recipe. For once, I followed a recipe exactly as published. First, you mix all of the ingredients together, place in a glass dish, then coat your pork belly in the resulting maple bourbon paste. Perfect meat to fat ratio! Our curing mixture, all ready for a pork belly exfoliation. One the cure is applied, place everything into a plastic bag, along with any remaining liquid and salt. 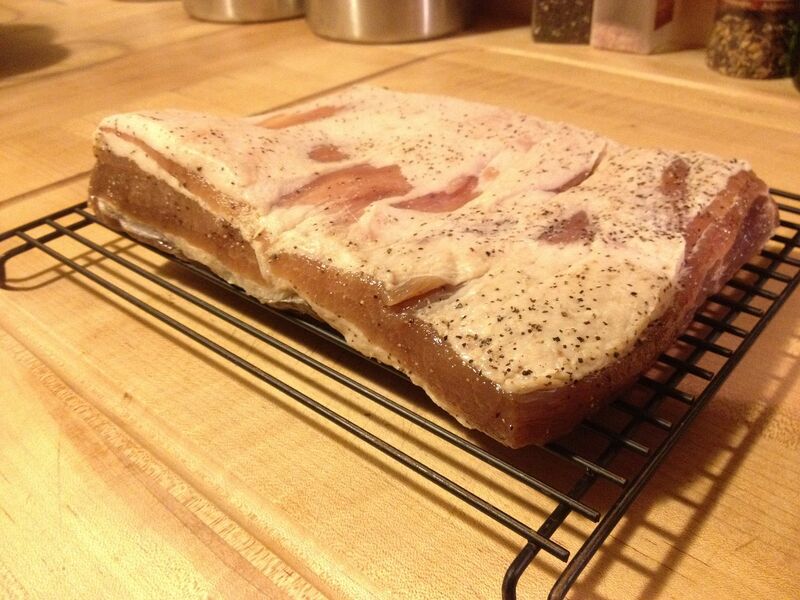 Place your curing pork belly in the refrigerator. 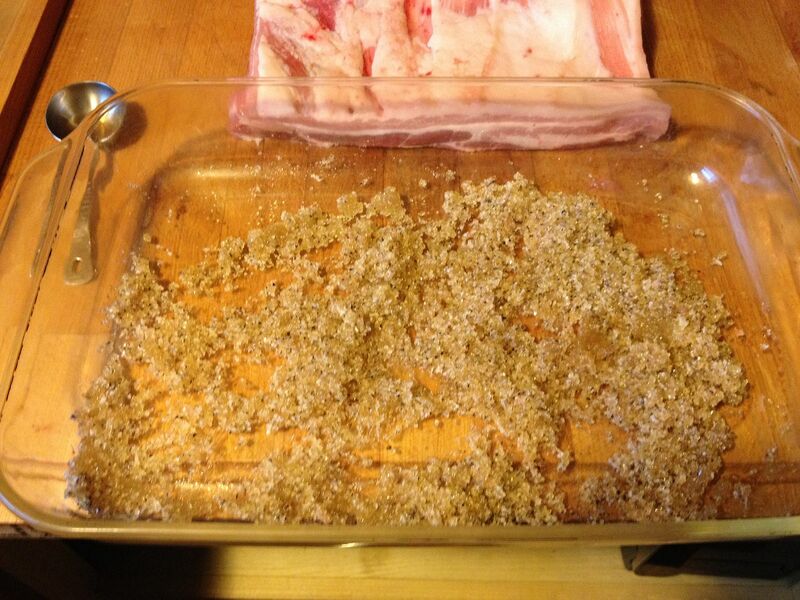 Every day for seven days, flip your pork belly, making sure to evenly distribute the liquid and massaging the salt and liquids into the meat. 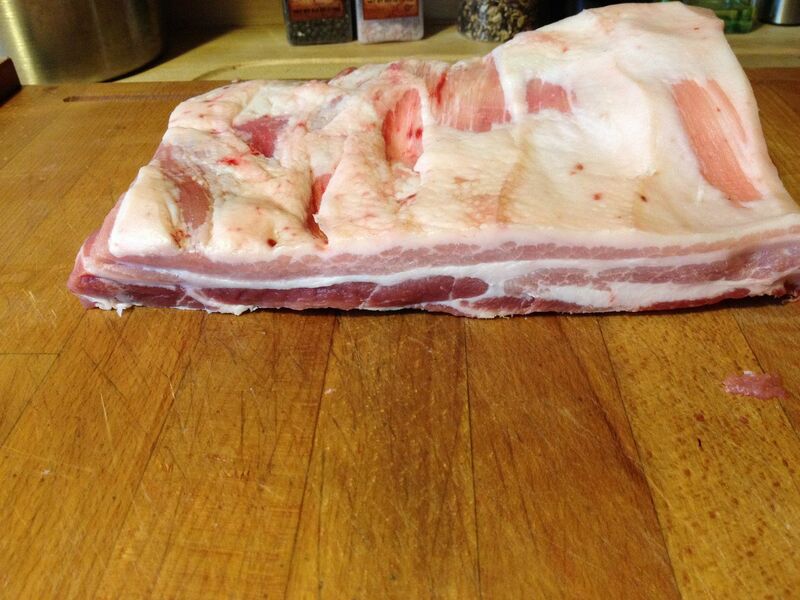 This ensures an even distribution of flavor and curing salt across the pork belly. After seven days, I rinsed the meat to remove any excess salt from the meat. Here is the final product, ready for the smoker. Then, I went outside and lit my smoker, bringing it to a temperature of 200 F. Once I reached that temperature, I added some pecan wood to the ash pan for smoke flavor. I choose pecan for the mild flavor that it adds to the meat. I also thought it would pair well with the maple and bourbon. 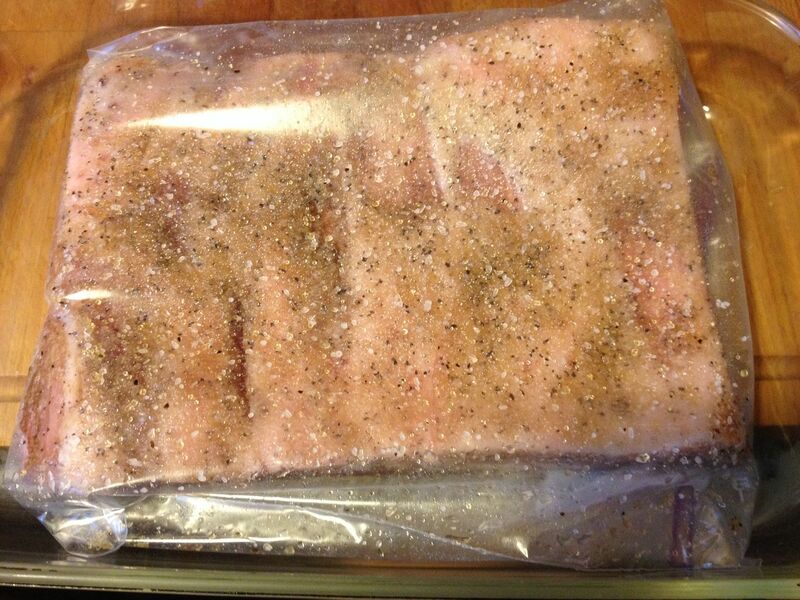 I smoked the pork belly at 200 F until it reached an internal temperature of 145 F. Then, I wrapped the belly in foil, placed into a plastic bag, and put in the refrigerator to chill overnight. Chilling the meat makes it easier to slice the next day. Placing the meat in a plastic bag helps to intensify the smoke flavor. The next day Hope, my slicer extraordinaire, sliced this belly for packaging. Of course we fried up a few slices to try them out. Maple flavor, check. Bourbon, check. Mellow pecan flavor? Yep, it brought it all together. 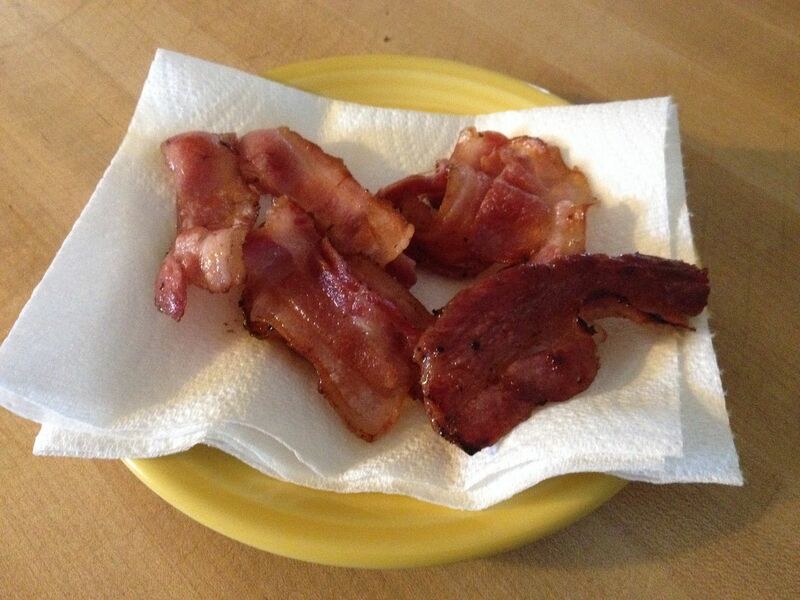 Overall, this is a good bacon. It was a good first try with this recipe. I used turbinado sugar instead of the brown sugar in the original recipe. Think that next time I will use the brown sugar and perhaps increase the bourbon and maple syrup amounts for more intense flavors.